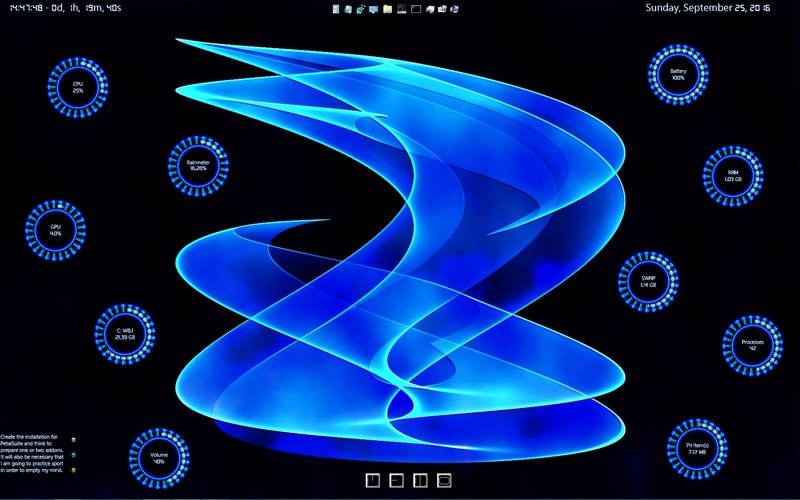 Round(V3) by Sephirotess: skins with "round line" and rotators. Use the "themes panel" to change the appearance (15) of the skins. Use the "wallpaper panel" (config) in order to install the wallpaper. - Time: shows time and uptime. - Recycle Bin: the skin shows the number of present files and their size. When the number of files reached the limit (fixed at 250), a sound is played and the color of the font changes. Left click open recycle bin. Right click empty it. - TopProcess: shows the most active process.